I saw this Dakine bag and I thought this would make an awesome coupon binder bag. If you have a big coupon binder like me, but no bag to carry it in, than take a look at this one. At only $22 it won’t break the bank because honestly, wouldn’t that just not look right if you were carrying your coupons around in an expensive bag. That would definitely be a coupon faux pas. The size of the bag is great to hold a coupon binder. There are some nice pockets on the side where you can put your cell phone and spots where you can keep the coupons you will be using during your shopping trips. It has a flat bottom which means the binder will not be stuffed in there making it easier to thumb through the bag without having to open it up in the middle of the store. 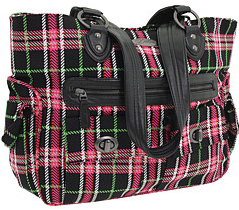 Okay, so I’m really, really convinced that I want this bag. So…maybe one of my lovely children will buy it for me for Christmas….hint, hint, hint. If you are interested in this or other Dakine bags at 60% off today only at 6pm, then go here. Harley Davidson, all styles, only $19.95.